94 chev s10 fullbore idle bad throttle? I have a 94 chevy s10 v6... my problem (was) a nasty whine or squeal... after 1 month of thinking and looking in a haynes book... i pegged it to be that the throttle body gasket was out since i could'nt find a vaccume leak. That did fix the squeal. Now the bigger problem. I have the good old boys at autoZone, Orielys, Napa, Car Quest, and Automotive supply stumped (normally they can help stupid problems). Now that the truck is running more correctly after fixing the thottle body gasket, oh there is always a but, but now it revs up full bore high idle in park, and high in gear. Stopping is a even bigger issue since its stuck in go mode. They did try the scan in the ALDL port and the map sensor didnt respond. tried a new map sensor and still didnt respond. Tried un-hooking the battery over night and pulling out the fuses. After a few friends who know some about cars looked at it, some say my throttle or carburetor might be bad to dumping that much gas in, & some say that because i bought the truck 4 months ago some parts are missing that the "throttle kick back cable"? is missing and so is the spring. One said that my EGR valve might be stuck or bad. Im not affraid to get my hands dirty, but I need my truck up and running soon! I have tried spraying carb cleaner along all vac line joints and conections. no change in idle sound. Do I dare take my carb and throttle body back off and check the gasket? 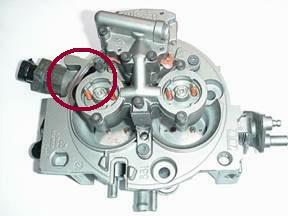 On top of the throttle body above the IAC motor there is a hole. That hole is the intake for the IAC valve. Cover that hole with something to see if the idle comes down. If the idle doesn't change you have a massive vacuum leak. You might want to backtrack you gasket installation to see if you missed something if that is the case. If the engine speed comes down or the engine stalls out by plugging off that hole, then the idle air control motor is open too far for some reason. With the TB gasket leaking the IAC motor could have been slammed shut for a long time. Sometimes the ECM needs to be reset so it can relearn the correct idle control values. You can reset by disconnecting the battery cable for 2 minutes.